“Did you put your lunch box away, is a common question I ask my 15-year-old son Michael. Nope, I didn’t have time, is most often the reply. This conversation seems to be a daily déjà vu moment for me. Didn’t I ask this yesterday? And didn’t he answer exactly the same? Yes, and yes. So, where did all this time go? In a search of the answer to the question, I watched a very good Lynda.com video titled “The Importance of Clear Goals” by Chris Croft. In this video, Chris reveals that the key in time management is to spend more time on what is important and, respectively, spend less time on what is not important. Wait a minute! – I thought. Everything I do IS important. As if he heard me saying this, Chris offered his view on how we determine which things are important and which are not. He simply states that if an activity moves us towards our goal, it is an important one. If it doesn’t, it is not. How much simpler could it be? As soon as I heard it, I started measuring my own daily tasks against this criterion. My own answer was, “The end goal is to make sure our students are successful! Not only do we need to make sure they are in to RRC, but we also need to make sure they are out successfully, with certificates, diplomas, and degrees earned”. “So”, I thought. Which ones of my tasks are serving the goal above? “All of them”, – I immediately replied to myself. But is it really so? I am sure all of us at RRC would like to think that all tasks we perform have the end goal of serving our students. While I am sure most have that end goal, I also think that some tasks are more directly related to serving students than others. Both options relate to explaining to your customers (students in our case) that we would like to provide an excellent service/product and that we may not be able to complete the task in the short time period. The key here is, we don’t want to make promises we cannot keep. Either to our customers or to our bosses. As someone who was raised in such a way that a person should always keep the promises s/he made, I related to this statement. My take away from this is that it is better to under promise and over deliver, rather than the other way around. So, let us find the tasks that really matter and spend more of our time on them! Overall, Chris’ video is a good one to watch for those who are looking for efficiencies in their daily life (both in and outside of work) and for those who are interested in practical solutions for reducing unimportant activities in daily operations. I recommend watching the video! When I arrived at RRC about six months ago, I was excited to learn that Lynda.com would soon be rolled out to students, staff, faculty and leaders at the college. I’d used Lynda before, at a previous workplace and through the Winnipeg Public Library, so I was aware that there were tons of high quality videos and courses on a variety of topics. Finding content is never the issue for me, but finding time to watch it can be a bit challenging. A new job in a new workplace as big and complex as RRC comes with a learning curve, and the pace doesn’t really slow down when I walk through the door at home. I’m usually greeted enthusiastically by my two energetic sons, six year old Milo and two year old Marcus, and quickly involved in a Lego project, dance party or (hopefully soon), a bike ride. So I’ve found some creative ways to incorporate Lynda into my routines so that I don’t have to miss out on any of the fun stuff at work or at home, because “Let’s play office!” with a toddler didn’t end up being the solution I was hoping for. In What’s Watson Watching you read about some great ideas on WHAT to watch on Lynda, now I’m here to share HOW I’m watching it. Lynda mobile app – did you know there’s a Lynda app? You can download it from the app store, enter your RRC credentials and it’s ready to go on your mobile device. I watch Lynda almost exclusively on my phone. The home page opens up to display courses you are currently watching so it’s easy to jump back in. It also displays your playlists and has an easy search function. Download courses and videos – did you know you can download courses and videos when you’re connected to wifi so you can watch later? I found this out on a recent trip. I downloaded some courses and watched them on a flight. Speed it up – by clicking on the settings gear in a video, you can increase the playback speed. I find that depending on voice of the narrator, 1.25 or 1.5x the normal playback speed allows me to take in the content a bit quicker without sacrificing quality. I’ve found any quicker than that is distracting but try the different speeds and see what works for you. Embracing micro learning – while I’ve found a number of full courses very valuable, my favourite Lynda videos are the weekly tips series. My favourites are Communication Tips Weekly, Leadership Stories Weekly and Teacher Tech Tips Weekly. Most videos are 5 minutes or less, and offer a quick and effective tip to improve your practice. I also find that these videos are great to download and listen to in the car. Not all Lynda content lends itself to car listening because they have visual elements that complete the learning experience, but Communication Tips and Leadership Stories are mainly auditory and make me feel especially productive during my commute. On the navbar, click Communication and choose Discussions. On the Discussions List page, from the New (1) button drop-down menu, click New Forum (2). Enter a title (1) for your new forum. Enter a description (2) for your new forum. The Description can be used to give any extra information you may have about this forum or the topics within. You can include rules of conduct, how and if this forum will be assessed, or general information about the forum. Allow anonymous posts – Selecting this option allows users to post anonymously to topics created within this forum. Anonymous posts display with the author “Anonymous” in the thread. NOTE: It may be a good idea to also include the option “A moderator must approve individual posts before they display in the forum” when using anonymous posts. 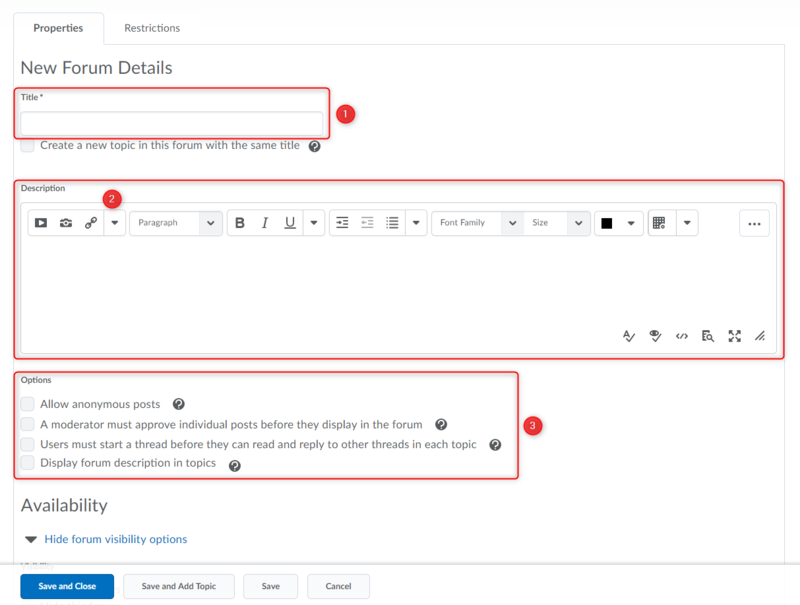 A moderator must approve individual posts before they display in the forum – Selecting this option will require a moderator to approve posts to topics created within this forum before they display to users. Users must start a thread before they can read and reply to other threads in each topic – Selecting this option will require a user to start a new thread in a topic before viewing or replying to other threads in that topic in the forum. If this forum requires post approval, users will not be able to view or reply to other threads until their thread is approved. This option prevents students from being influenced by each other’s initial posts. It also is a great way to spearhead engagement as it forces each student to initiate a thread rather than simply replying to other student’s initial posts. Display forum descriptions in topics – To provide instructors the option to display a discussion forum description within a discussion topic description. Availability – Visibility – The options under visibility control if and when the student can view the forum and all the topics and threads below it. Often instructors will allow a forum to always be visible and control access with the “Locking Options”. Locking Options – Locking a forum will maintain the visibility of the forum, topics and threads, but remove access from the students to create new posts and replies. This can be used to archive a past forum maintaining visibility, or to allow a preview of an upcoming forum. 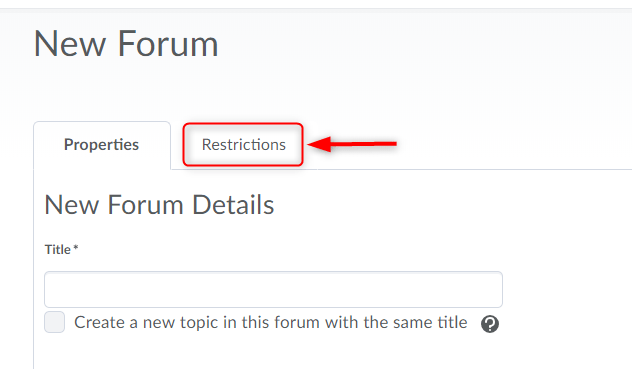 Restrictions (Tab near the top of screen) – Here you can apply release conditions, or restrict the forum to a group when you are using the groups tool. NOTE: You can create forums from the groups tool when you are setting up groups. You will see a list and the status of any rubrics that you have created or have been shared down to your course. Next click “New Rubric” or click the dropdown menu (“V” icon at the end of the name) associated to an existing rubric to edit it. Give your rubric a name (1). You can write a description if you want. Your rubric will be in “Draft” mode while you work on it. When complete make sure you set it to “Published” (2). Typically we will use the “Analytic” rubric when building a rubric for college use. Feel free to experiment with the Holistic rubric type, but it will behave quite differently than what I’m describing in this tutorial. Analytic Rubrics –Most rubrics are analytic. An analytic rubric breaks performance into multiple criteria. You assess each criterion separately, resulting in an overall assessment score. For example, an analytic rubric for assessing essays could have separate criterion for spelling, grammar, and expression. Each criterion can be assessed as poor, good, or excellent, resulting in an overall assessment that adequately evaluates performance. Holistic Rubrics – Holistic rubrics do not break performance into separate criteria. Performance is assessed holistically, so that you consider several different criteria, but make only one overall assessment. 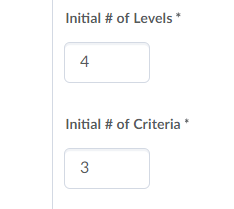 Set the number of levels (example: below average, average, and above average would be 3 levels), and number of criteria you will be using. You can always add and remove criteria when building the rubric. 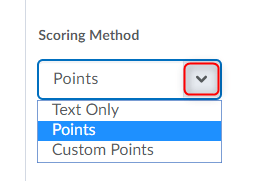 The scoring method can be points, custom points, or text. The difference between points and custom points is that points will assign one value for all criteria under a specific level, where custom points allows for custom points for each criteria under each level. Feel free to click “What are scoring methods?” for more details. 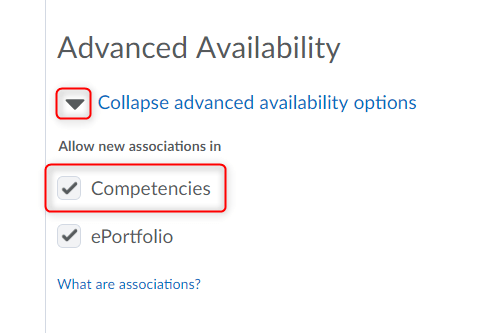 Please don’t remove the checkbox from “allow new associations in competencies“. If you leave it checked, it won’t cause any ill affects. If you un-check it, your rubric won’t be as functional for grading in a Dropbox etc. “What did your childhood smell like?” According to the instructor of this Applied Curiosity course on Lynda.com, this is one of the Most Valuable Questions (MVQ) she uses to get to know someone new. In case you are wondering, my childhood smelled like motor oil (from my Dad’s car dealership), hardwood floors and sweaty toe shoes (from my Mom’s ballet studio), and the sweet baby powder smell of my Cabbage Patch Doll named Saranella (yes, really, that’s what I named her and even sent in the birth certificate to prove it). Now, I did not expect this question in this course. Then again, perhaps I should not have been surprised. After all, having reviewed seven Lynda.com courses before this (and having watched at least twice that many to identify appropriate courses to write about), I’m keenly aware of a repeated theme: Know Thyself. Many of the courses I’ve reviewed for this series reinforce the importance of self-awareness as the first stage of learning. I started “What’s Watson Watching” to add new professional skills and gain more knowledge. What I did not expect was the significant personal reflection (and hopefully growth) that has resulted from watching these courses. This course on Applied Curiosity continues the theme of Know Thyself, with its clear insistence on understanding our own motivations, biases, and work styles first as the critical foundation for fostering good practices of curiosity. The instructor, Becki Saltzman, suggests that when a new situation arises, natural curiosity quickly can be drowned by feelings of inadequacy or by passing judgement on others. If we can develop an awareness of when this descent into fear or judgement occurs, she offers a technique to bring us back to a place of curiosity. This technique utilizes as a visual metaphor to “trigger” an elevation into a place of curiosity. Saltzman uses a pogo stick as her “trigger” image. The next time I am aware of these tendencies in a conversation, I will utilize this technique to visualize outward moving concentric circles flowing from the centre of a pond to open up space and possibility (I am a Pisces, so I tend to like water metaphors). What would be your “trigger” image to elevate your curiosity? Another opportunity for self-awareness in this course is through Saltzman’s introduction of four Curiosity Archetypes: adventurer (Amelia Earhart), philosopher (Aristotle), observer (da Vinci) and problem-solver (Einstein). She suggests that each of us follows one of these archetypes and notes that having each of these on a team can increase the effectiveness of a project (fortunately, she also notes that we can move between archetypes depending on context and audience). While I’d like to see myself as the adventurer, I’m probably more comfortable as observer. 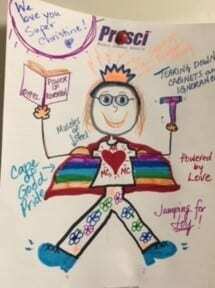 Which of these archetypes resonates with you? While some of the course content seems to be a bit extraneous (such as the sections on data analysis – no offense to our RRC institutional research team), the idea that curiosity must be well timed to be effective was one of the most valuable take-aways from the course. Saltzman challenges the notion that asking good questions is helpful all the time; instead, she reminds us that one must be politically savvy and socially aware when being curious. In other words, knowing when to be curious (being mindful of audience and context) can be just as important as knowing how to be curious (my Dad’s favourite Kenny Rogers’ song comes to mind here: “You gotta know when to hold them, know when to fold them, know when to walk away, know when to run…” I guess that would be the answer to the next question: “What did my childhood sound like?”). As a final reflection, I understand now that the two types of curiosity that Saltzman identifies have framed my journey through these eight Lynda.com courses. I have chosen courses because I simply want to know more about the topic (which she defines as “free-range curiosity”), or for immediate application to help solve problems or manage specific issues (which she terms “applied curiosity”). No matter the motivation for choosing them, all of the courses I have reviewed have enriched my self-awareness and enhanced my professional capacity in some way. Thank you to everyone who has joined me on this journey by reading the reviews or watching their own choice of Lynda.com courses. Thanks especially to my Lynda.com cheerleaders, Carrie Schaepe and Jacqueline Wood, who have supported this series in so many valuable ways. May we all continue to play, to grow, to learn and to be curious about how we can individually and collectively make a difference for our students, our colleagues, our College and our communities. Please let me know at cewatson@rrc.ca if you have a favourite Lynda.com video that you have used for personal or professional reasons. And look for upcoming guest reviews of Lynda.com videos in the next few weeks! I love my work at Red River College because I work with inspirational people who are passionate about education and the success of our students. I also enjoy my work because no two days are ever the same, with constantly emerging opportunities and issues keeping me in constant problem-solving mode. But that doesn’t mean that I also don’t end up approaching those situations in the same way, using the same meeting agendas, and applying the same assumptions to solving problems. By doing so, I end up being less effective, less creative and sometimes even losing my own energy for the work. In other words, even in an extremely busy work environment, ruts happen. As some of you will know (from earlier “What’s Watson Watching” reviews), I’m curious about creative practices in leadership, and ruts can prevent me from being my most creative. According to Stefan Mumaw, the instructor for this course, ruts are simply mental patterns that are so repetitious that they become unconscious. These routines can inhibit our ability to see anew and may dampen our interest in trying something new. These apply as much to work ruts as they do to personal situations, including ruts in parenting and personal relationships. In my case, I notice that ruts often happen when I’m feeling overwhelmed or too tired to approach a situation in a new or novel way. Whether at work, trying to engage my kids, or in my marriage, it becomes easier to stay in the routine than to make the effort and expend the energy to try something new. Not surprisingly, then, it resonated with me when Stefan explained that ruts often develop because we are so focused on output and productivity that we forget to fill our creative tanks. • Be a pattern hunter – track your routines and track your time (I’ve recently started a new journal technique called Bullet Journaling, which has led to a fascinating review of my habits). • Say yes — embrace opportunities that take you out of your comfort zone (I recently read Shonda Rhimes’ “Year of Yes” – fascinating). • Take on a difficult project – seek perseverance and focus (one of my favorite TED Talks is Matt Cutts’ talk on the power of 30 day challenges. I just completed a 30 day yoga challenge and loved it, even if I still look like a wounded partridge on a mat). Overall, I found this Lynda.com course to be a good combination of theory (the biology and psychology behind ruts) and practical advice (the practices that can help us to break ruts). I would have appreciated more real-life examples of people who were in ruts and what they did to address them. What practices did they use? How did they overcome ruts? I always appreciate illustrations of what has worked for others (and even what hasn’t). Other Lynda courses have included these kinds of examples, so I think this course could benefit from the same. That said, perhaps you can provide your own examples. What are your ruts? Are they personal and/or professional? What techniques offered in this course might be useful to help you seek new ways of seeing, thinking, or problem-solving? What are you feeding your creativity? E-mail me at cewatson@rrc.ca and let me know. Good luck with your rut-busting! One of the most rewarding and important roles I have as Vice-President Academic is to support the development of the colleagues with whom I work. It is wonderful to witness someone start a new role, embrace a new challenge or take a risk because they feel supported to do so. My role in the coaching relationship is to walk alongside, to listen, to draw out ideas, and to encourage stretch opportunities. Coaching takes practice, time and commitment – and I don’t always get it right. However, coaching is a critical investment in our own people. In fact, research shows that a culture of coaching can directly benefit an organization through building stronger talent, preparing for succession, and supporting effective employee engagement. I chose to review this Lynda.com course because I want to continue to practice my skills to better support my team. Similar to the conflict resolution course that I reviewed a few weeks ago (led by the same instructor, Lisa Gates), this course uses a series of vignettes that present coaching conversations between a manager and a new leader on her team. The exchanges accurately (in my experience at least) reflect the sometimes difficult terrain that managers need to travel when supporting team members. I also found it helpful when a “what not to do” scene was presented alongside a “do this instead” option (and, honestly, recognized myself in both scenarios!). One of the key messages in this course is that coaching should always be future focused (“what’s possible?”) and, therefore, it is not just for colleagues who may be struggling or need additional support. It can also serve to support new hires to the organization, staff leading new projects, and high achievers with career aspirations. When we spend time really listening, approaching the situation with curiosity, and asking questions to gain different perspectives, we can help our colleagues gain clarity and move forward with renewed commitment. Perhaps you’ve been in a conversation with someone where you’ve asked a question that changed their perspective on the situation and helped them identify next steps – that’s a coaching moment! Although the course is focused primarily on the manager-employee relationship, the techniques presented in this course – especially the Power Talk questions and process – are widely applicable and can be immensely helpful in peer support conversations and even in personal conversations with partners, family and children. Ultimately, coaching is about listening, asking powerful questions, and providing a safe place for others to explore ideas, take risks, practice new skills and celebrate success … and we can all use that kind of support! Have you ever been in a coaching role? Have you ever been coached? What made those experiences meaningful and valuable? What did you learn? Before you start to transfer your LEARN grades to Colleague first check to ensure your LEARN gradebook is setup correctly, that student grades make sense, and that you have transferred the final calculated grades to the Final Adjusted Grades column in LEARN. Click here for instructions to transfer final calculated grades to Final Adjusted Grades. Note: Student grades do not have to be published to students to transfer them to Colleague. You should now see a list of students, their grade in the LEARN gradebook, and a suggested grade based on their LEARN grade. 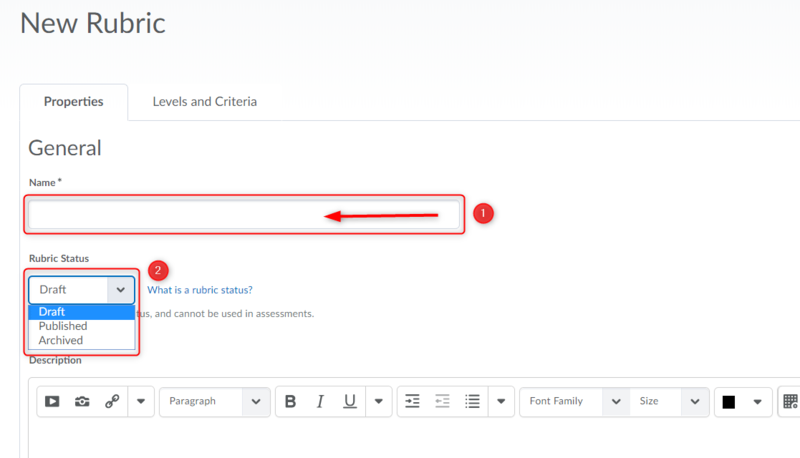 If the Suggested Grade already exists and has no drop-down option, this means that the grade has already been submitted to Colleague and can not be changed. Select the checkbox beside the student’s name you wish to submit grades for, choose a grade from the drop-down list, or leave it as the default suggested value.If you select DNW or INC for a grade, you must set an expiry date for this temporary grade. 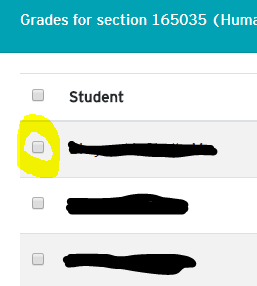 To select all students in this section, check the box in the heading beside Student. Once you have made all the changes you want, click Submit Grades. The number to the right of Submit Grades represents the number of students who will have grades submitted. Submitting grades can take some time. Once your grades have been submitted, you should see a green success message and on closing the message, you will return to the previous screen. From here you can continue to submit grades as needed. If changes need to be made to grades after submitting please contact your applicable Student Records Officer (SRO) through Enrolment Services. If you encounter any issues with this process, please email LEARN support at learn@rrc.ca. What do Saturday Night Live and Red River College have in common? More than you might think! Like Saturday Night Live actors, many of us improvise on the spot almost every day. Whether in the classroom or in meetings, unexpected situations arise constantly that require us to pivot quickly and work with others to identify the new direction. Initially as an instructor and now as an administrator, I am fascinated by the relevance of improv principles to my own work. I am inspired by the speed at which the actors adapt and how they support each other. I believe there are many improv techniques that can directly apply to how we teach, how we work and how we lead. My fascination originally led me to explore to improv techniques for adult learning at Kwantlen Polytechnic University. At the time, I discovered the value of building “play” into a teaching environment and of creating scenarios where everyone wins and it is safe to make mistakes. I chose to watch this Lynda.com course because of its link between improv principles and key leadership practices. Through the use of entertaining workshop games, facilitator Izzy Gesell reveals that improv (like good leadership) relies on several key practices: the participants’ ability to be present in the moment; active listening skills; and the group’s commitment to co-creation. This act of co-creation is built on the “Yes, and…” improvisation technique. We have all heard “Yes, but…” when someone introduces a new idea. In improv, however, the substitution of “yes, and” instead of “yes, but” creates a space for creativity and possibility. I invite you to see how it feels to use “yes, and” instead of “yes, but” in a conversation (trust me, it really does feel different!). Gesell illustrates another principle of improv through the activity of “one word at a time” storytelling. In this game, two people co-create a story, each contributing one word at a time. After watching the Lynda.com course, I played it with my wife and sons (who are 10 and 12), with hilarious results. As we played, I realized I could not control the direction of the story and, in fact, needed the other person’s contributions to know where we were going. It was a great leadership lesson to (re)learn. “Listen. Say yes. Live in the moment. Make sure you play with people who have your back. Make big choices early and often. Don’t start a scene where two people are talking about jumping out of a plane. I would love to hear from you – in what ways do you find improv techniques to help with your teaching or professional practice? I grew up in a family that expressed great love and equally great conflict. I remember laying in bed listening to my parents argue late into the night (usually in hushed tones, but not always). Similarly, my younger brother has turned every conversation into a jousting match. Perhaps then, it is not surprising that I learned early on to avoid conflict, to stay quiet, to be the good girl. I never felt physically unsafe, but the verbal sparring was often a source of anxiety. As I got older and moved through my career (and a divorce), I learned that conflict is a natural and necessary part of the human condition. I also learned to lean into conflict and developed healthy tools to navigate differences of opinion, values, agendas and perspectives. “When you are a Bear of Very Little Brain, and you Think of Things, you find sometimes that a Thing which seemed very Thingish inside you is quite different when it gets out into the open and has other people looking at it.” (A.A. Milne, The House At Pooh Corner, 1928). This course illustrates the importance of seeking different perspectives through a simulated conversation between a senior engineer (Gina) and her manager (William). The scenario introduces several conflict resolution strategies, including opening the conversation (often the hardest part), reframing with tactical empathy, and engaging the other person in finding the solution. The conversation between Gina and William is very realistic (it even made me uncomfortable at times) and illustrated the use of these strategies towards a successful outcome. This course was a surprise for me. I was not expecting its insistence on self-awareness as a core theme, and I did not expect to learn techniques that were immediately applicable. Instead, I found the learning both humbling and impactful. In fact, the techniques introduced in the course changed the way I approached recent conversations, including one with my Dad last week that went remarkably well. I was also reminded yet again that my responses to conflict can be different from the ones I learned as a child and, for that, I am deeply grateful. I encourage you to watch this course and would love to hear what you thought of it too – email me directly at cewatson@rrc.ca.